After installing the replacement rear deck in the last update the next step in our Corvette restoration project was to align and install the replacement tail light panel. As you’ll recall, the original was totally shot and damaged beyond repair. After giving it a bit of consideration I chose to purchase a hand layered panel instead of a factory correct press-molded panel in an effort to save some money. In my case I’m not overly concerned with originality so the cost savings made the trade off worthwhile to me. As anyone who’s worked with replacement fiberglass panels already knows, some amount of trimming and fitting of the replacement panel is required to achieve the proper fit. As a starting point I used the contours of the bonding strips on each side of the car to set the initial height and alignment of the tail light panel. Once in place the panel was clamped in place to allow a more detailed fit-up to be completed. Much like the rear deck, the tail light panel needs to be adjusted in three dimensions: 1.) up and down, 2.) left and right, and 3.) front to back alignment at the bottom of the panel. In my case criteria two and three were essentially set by the bonding strips and body panels that were already in place. That left setting the vertical alignment of the panel. To set the vertical alignment of the panel I marked out the centerline of the rear deck, and then drew vertical offset lines at 15″ and 22″ left and right. A tape measure was then used to take vertical measurements from the top of the rear deck to the lip near the bottom of the tail light panel at each offset mark. The theory behind this is that, if the tail light panel is properly aligned to the rear deck, the measurement at 22″ left will match the measurement taken at 22″ right and the measurements at 15″ left and right should also match. The final alignment of the panel was then set by balancing these measurements while also maintaining the body line set by the drivers side quarter panel. For what it’s worth, if you’re replacing only the tail light panel and both rear quarter panels are in place this becomes a fairly simple task. In this case the panel alignment could be easily set by matching the body lines on the tail light panel with the lines set by both rear quarter panels. With the alignment of the tail light panel set several alignment marks were made with a black marker to allow the panel to be easily repositioned after trimming. Next, the job of marking the panel for trimming was started. First, the sides of the panel were marked using a pencil..
Next, the top of the tail light panel was traced along its full length. Once traced the tail light panel was removed and measurements were taken between the trace line and the edge of the rear deck at approximately 12 inches on center. These measurements represent the minimum amount of material that needs to be removed from the edge of the tail light panel. Initially, the panel was marked to remove only as much material as required. More material was removed later in the process to provide reasonable clearance between the edges of the rear deck and tail light panel. This ‘play-it-safe’ approach helps prevent over trimming the panel. Once the distances were transcribed to the tail light panel the points were connected using a straight edge ruler and a black permanent marker. Next the panel the edges were trimmed. Using a die grinder with a 24 grit sanding disc made pretty quick work of this task. After completing the first round of trimming the panel was aligned back on the car and additional measurements were made and transcribed to the panel. These marks were laid out to provide a gap of about 1/8″ between the edges of the adjacent panels. After all trimming was completed the rough edges and lines of the panel were evened out using a DA sander with a 200 grit sanding disc. The next step of the installation process was adjusting the thickness of the replacement panel. I found the new tail light panel was about 1/16″ to 1/8″ thicker than the original press molded components. I suspect this is typical for most hand layered replacement panels. 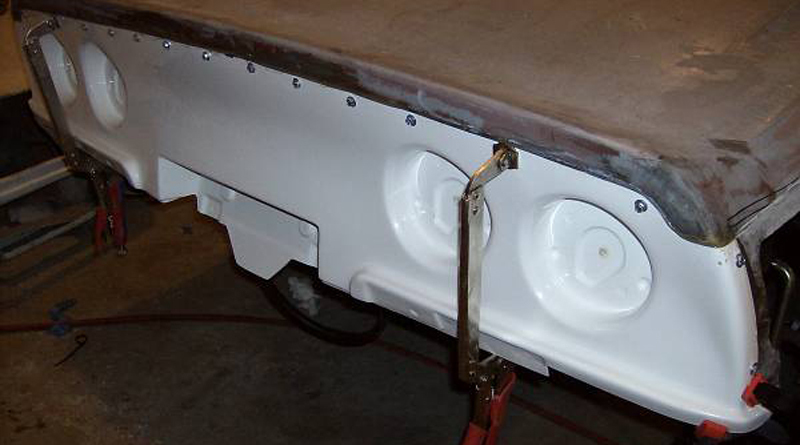 In order to provide a flush surface between new and proposed parts, the thickness of the tail light panel was sanded down as needed along the bonding surfaces. Whereas the bonding strips project approximately 3/4″ beyond the edge of the panel this sanding process was concentrated to an area within 1″ of the panel edge. Once again a die grinder with a 24 grit sanding disc was used – just be sure not to remove too much material! In order to achieve an even surface a simple dial caliper was used to take measurements as material was removed from the back of the panel. The goal here is to grind down the back of the panel so that the back surface is parallel with the front surface. This ensures the panel will lay flat on the bonding strip and will produce the best possible fit and finish. Using the caliper allowed me to easily determine if more material needed to be removed from the edge of the panel, or nearer the center. In the photo below you can see the caliper is tight to the panel near the black line (the traced edge of the bonding strip), but a gap exists near the edge of the panel. In this case, more material needed to be removed near the black line to provide an even surface. Removing the extra material was completed as a series of steps. First, a bit of material would be removed from each area of the panel. Next, the panel would be test fit to the car and a note would be made regarding how much more material needed to be removed. Lastly, the panel would be removed and sanded down. This process was repeated, removing a bit of material after each test fit, until the desired result was achieved. It took about two dozen trips back and forth, but eventually I ended up with a panel that had excellent fit and finish. After all of the trimming was completed, the panel was once again clamped to the rear clip and adjusted to the desired final position. Once in place the edges of the tail light panel and underlying bonding strips were drilled to accept temporary screws. Here we used the same process that was used during the Rear Deck Installation. Additional details on this method of temporarily holding the panel in place can be viewed starting approximately half way through that update. In this case holes were drilled at approximately six inches on center. In two locations I was able to eliminate screws by using my long reach vice grip clamps. It’s not a huge savings, but it’s something! After completing the drilling process the panel was removed one last time and the mating surfaces were smoothed out using a DA sander with a 200 grit sanding disc. This process was also used to blend the sanded down portion of the panel into the surrounding area. After cleaning the tail light panel and bonding strips with lacquer thinner epoxy adhesive was applied to the back side of the new panel. Once again, Lord Fusor 127EZ epoxy adhesive was used to bond the panel to the rear clip (click the link and scroll 3/4 of the way down the page for more information). Once the adhesive was applied the screws and washers were given a quick spray with WD-40 (to prevent the adhesive from gluing them in place), the panel was positioned, and the screws were installed and tightened. As noted in the last update, it doesn’t take a lot of pressure to pull the panels together so be sure to work carefully to avoid stripping the screws or squeezing out too much adhesive from between the panel and bonding strip. Once the screws were in place the adhesive was left to harden. The next steps will be to install the new rear quarter panel, followed by the new rear valence panel. Before long this Corvette may actually start looking like a car again! As always, thanks for stopping by to check out my progress. Another update should be posted in about a month. In the meantime, why not stop by the new Corvette Restoration Forum to discuss the project, ask your questions, or just to see what other folks are saying.